The following represent some of the most common questions we are asked. Please contact us if you have one that isn’t answered on the list below. We take great pride in supplying you with premium quality prints at incredibly competitive prices. We can help, whether you want just one print to use as a gift or to hang on your wall, or need us to print thousands of print. No order is too small or too large. If your images are digital, you can either email them to us, use or online order system or burn them onto a CD. We can accept emails up to 50mb in size. Alternatively, you can use one of the free file sending services like yousendit.com or free.mailbigfile.com. Our turnaround times are 96 hours from confirmation of proofs for almost all orders. If you genuinely require your print faster, then we will be happy to offer you a shorter turn-around time at no additional cost. Please remember that you need to add transit time to our turnaround times. These vary from next day, to 4 working days depending on the freight method you choose. You do not have to pay for your prints until you have received them and are completely satisfied with the quality. Once your print ships we will email you an invoice containing our bank account details. We would appreciate payment within 7 days of receiving your print (provided that you are completely delighted with the product we supply). Our aim it to absolutely delight our customers. If you receive your print and are not completely delighted, then simply return it to us we will either reprint it to your satisfaction, or cancel your order and not charge you a cent. The choice is yours. Please see the Incredible BrilliantPrints Guarantee for more information. Canvas is completely different to printing on other media. We can create incredibly sharp prints from much lower resolution files than would be required for traditional photo paper. We are not willing to provide a table showing the resolution required for different sized prints. This is because the maximum print size depends so much on the quality of the camera and subject matter of the image. Instead, we welcome you to send your image to us for an obligation free evaluation. We will let you know the largest size we can print from your image, as well as pricing for a range of sizes. Because we make a custom frame for each of your images, you can have just about any size that you like. Our maximum size is 1.6 metre x 12 metres. There is no additional charge for custom sizes. All of our prices include GST. Our delivery rates need to be added to the print cost. We offer incredibly competitive freight rates. Please visit our freight page for more information. BrilliantPrints is a specialist canvas printer. It is all that we do, and we take great pride in doing it well. Our product is superior to just about every other canvas print on the Australian market, and is incredibly competitively priced. Furthermore, no other canvas printer offers the peace of mind that you receive with the Incredible BrilliantPrints Guarantee. We have shipped thousands of prints all over Australia and the world, and most of our customers keep coming back to order more prints. Canvas printing is a term used to describe a process by which fine art and photographs are printed on canvas. Canvas printing is also known as Giclee (Zhee-Clay) printing. The technology used is similar to inkjet printing, but on a much larger scale. The process is used by professional / amateur photographers and artists, and can produce output that rivals traditional photographic methods such as silver-halide and gelatin (Kodak printing). When printed on suitable media, canvas prints can last in excess of 70 years with no noticeable fading. Almost every major art gallery in the world would have prints made using this technology. Recently in New York , a print made using the same technology that we use sold for $35,000. Our printing is perfect for photographers and artists who are looking for wide format, long lasting prints of exceptional quality. Yes, we are not a company with a flashy website that operates from a garage. We have a state of the art showroom located in Brisbane . You are welcome to visit us at Unit 27/ 315 Archerfield Rd , Richlands, Brisbane. Our showroom contains a whole range of different prints to inspire you. Yes, BrilliantPrints operates from a modern production facility in Brisbane . We employ 6 staff and have a showroom that you are welcome to visit. We have supplied thousands of prints to retail clients, professional photographers and interior designers all over Australia . Our clients include companies such as Coca Cola and the CSIRO. We are a professionally operated company, not fly-by-the-night garage-based business. How is your canvas made? 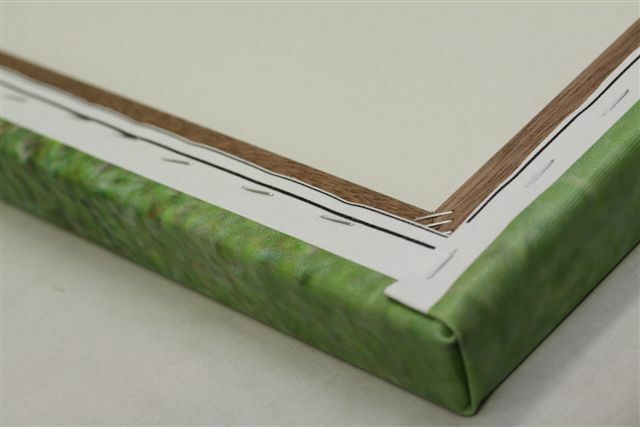 Many canvas printers simply fold the canvas over the outside of the frame at the corners. This results in an unsightly print that looks unprofessional. BrilliantPrints has developed a unique method of cutting and folding our corners, which results in a neat, discreet fold that is almost invisible. We can offer full colour, sepia, or Black and White printing. In fact, BrilliantPrints is one of the few canvas printers in Australia with a dedicated black and white printer that is capable of creating perfectly neutral, incredibly sharp black and white prints. Most of our competitors use a colour printer to create black and white prints. The result is a washed our print that shows green and magenta colour casts. Why settle of an inferior black and white print, when you can own an incredible black and white print at no extra cost ? We use a beautiful canvas sourced from the United States . It is an archival, acid-free matte canvas. It is smooth, bright white and offers excellent reproduction for both photographs and fine art. Our canvas showcases exceptionally dense black and colors, is water resistant and is used by thousands of artists around the world. It is significantly heavier than the canvas being used by many of our competitors. Lighter grade canvases are generally cheaper to make, but are usually of lesser quality. In our opinion, there is no higher quality printing canvas available anywhere in the world. We use high quality colour inks imported from the United States . These pigment inks have been tested and used by over 10,000 customers worldwide. They offer an excellent colour gamut (range of colours) and resistance to fading. They have been independently tested by the Wilhelm Institute to last up to 75 years before noticeable fading. Our Black and white inks are actually carbon based, meaning that they will resist fading for 200+ years. They are specifically designed for printing on canvas, and offer an incredible tonal range and allow us to create perfectly neutral black and white prints. BrilliantPrints gives you the choice of three levels of protective coating. Full gloss – Generally suited to images that will be displayed in areas with low ambient light. Our gloss coating adds a easily cleaned protective coating that provides excellent abrasion resistance. In high light situations, you may find that the coating becomes reflective, making it difficult to see the image. Lustre, or semi gloss – This is the most popular coating we apply. It offers a great compromise between ease of cleaning and reflection. Your print shows very little reflection, making it easy to see the image. It can be wiped down with a damp rag, and offers excellent abrasion resistance. Matt – Our matt coating shows almost no reflection from the surface of the print. It is not as resistant to abrasion and is more suited to areas that contain little dust. Yes, we employ professionally trained photographers who take care of our pre-printing work. This includes the enhancing the colour of your images, fixing scratches and editing your images to your specification. We offer 20 minutes of professional image editing per print at no additional charge. This includes creating collages, cropping, resisizing, preparation of proofs etc. This is more than enough time to completely most work. In the event that it will take longer, we will contact you first to discuss. Many canvas printers will try to tell you that the canvas they use is “the best quality on the market”. However, this is simply not true. Most of the fine art museums and galleries around the world are using the same premium quality canvas that BrilliantPrints uses. This is because it offers better texture and colour, as well as lasting longer. Some canvas printers use solvent printers to create their canvas prints. Solvent printers are used mainly in the outdoor signage markets and are not suited to high quality canvas printing. The printers we use are designed specially for the task of canvas printing, and offer much rich colours than solvent printers. Solvent ink is basically an acid that burns into the surface of the canvas. Our aqueous inks are designed to be absorbed into the specially coated canvas that we use. 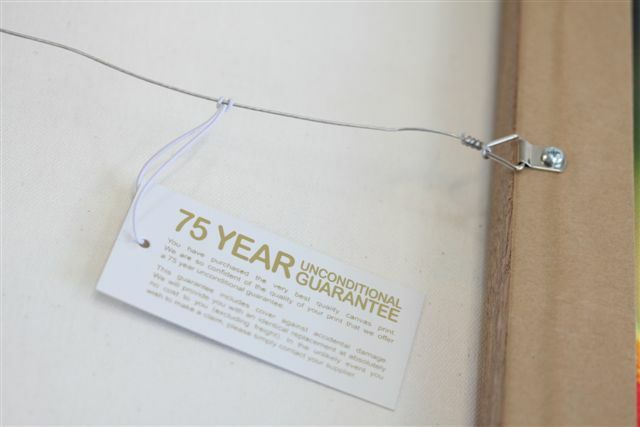 More importantly, the ink we use has been independently tested to last 75+ years without fading. Solvent printers have simply not been tested against fading, as they are designed to produce signs that need to only last 3-5 years. Coloured prints on our canvas have been independently tested to resist fading for up to 75 years. Our Black and White prints have been independently tested to last 200+ years without visible fading. All of our canvas prints are coated with a high quality spray coating that provides resistance to moisture, and additional 75 years of UV light protection and scuffing. Yes. Some canvas printers will tell you that this is not an essential part of the process. Usually, this is because they are trying to save money or simply do not want to invest in the equipment required to add this vital protection. No, canvas printing involves a great deal of chemistry that ensures that the media, ink, and protective laminate that are used are compatible. Research performed by the world renowned Wilhelm Institute ( www.wilhelm-research.com ) tested the same ink under the same conditions on two different types of media. One lasted 2 years before fading, the other was still going strong after 75 years of simulated light exposure. We have invested a great deal of time in testing the inks, canvas and spray coatings available around the world. The result is that we can confidently offer you a combination of ink, media and laminate that have been tried and tested by professional artists and photographers around the world. BrilliantPrints is one of the very few canvas printers who does absolutely everything in-house. This results in a better quality product, at much lower prices that our competitors. 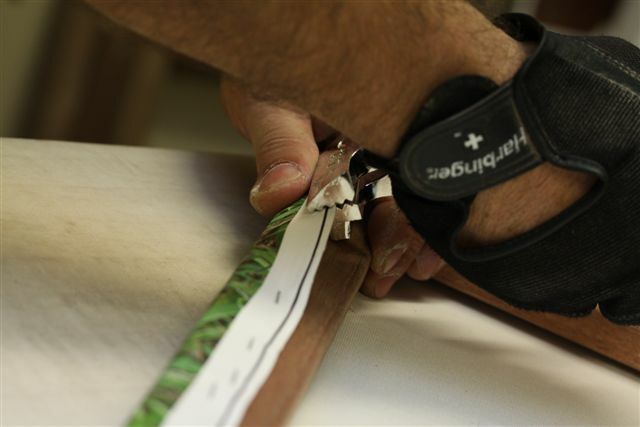 Your print is carefully stretched over profiled Meranti timber framed. The canvas is then securely stapled to the frame. We then tape the edge of the canvas to the frame to protect against dust, and insert hanging hardware (plastic covered stainless steel wire and eyelets) so that you put your print straight on the wall. We can either wrap the image around the edges of the frame (as shown in the picture), or print an artificial border that allows the full image to be shown on the front of the wrapped canvas. Once we receive your image, we will email your proofs showing the different wrapping options.